Andrew Kalley is a native New Yorker, born and raised! Active and athletic his whole life, he has a competitive background in Ice Hockey, Volleyball, Wrestling and most recently Triathlon. Beginning in 2006 Andrew tapped into the sport of Triathlon with the goal to do one race. In less then 7 years Andrew has competed in almost 50 races. 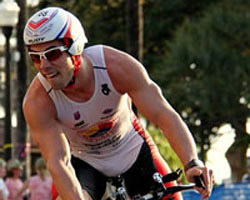 He is currently an Elite Triathlete and Coach for Full Throttle Endurance. He has won 7 races overall and placed top 3 in over 15 other races. He won the NYC Tri, Sherman Tri, Stamford Tri, Mighty Montauk and Natuica South Beach Tri just to name a few. With over 10 year of experience, Andrew continues to build a successful career in the sport. He is both a Certified Personal Trainer through the National Academy of Sports Medicine and a Certified USA Level II Triathlon Coach. Triathlon has become a niche for Andrew Kalley and as a coach, he has a strong passion for helping individuals reach their goals. Over the years, Andrew has developed the unique ability to work with clients from a wide range of abilities, goals and ages. In his time with Full Throttle Endurance, the team has won 4 back-to-back Club Championships and currently have over 100 athletes. And he is dedicated to growing sport of Triathlon—he currently runs a program focused on developing new and beginner athletes. Andrew is known for taking people from the couch and to the finish line. Danny grew up playing baseball as a little leaguer in the Bronx, New York. He played through high school and attended New York University as a Metropolitan Studies and Music Business major. Fresh out of college, Danny worked in the music industry as an audio engineer and production manager for live concerts and tours. He switched his focus and energies to triathlon in 2010 and became a certified USA Triathlon Level II Coach. He currently coaches the Full Throttle Endurance Level 1 program in New York City at their Chelsea Piers facility. Danny spends his time working with athletes on improving their basic skills and developing their foundational training structure. Passionate about triathlons, Danny devotes a lot of his time training and racing around the country. Hungry for more knowledge and information, Danny has his personal training certification from National Academy of Sports Medicine along with others from swimming analysis to TRX and Kettle Bell training. Encouraging and motivating his athletes and teammates keeps Danny busy from very early morning swim sessions to late night group run training.